Glass Dharma : David Leonhardt has been a lampworker (glassblower) for over 10 years. His wife, Gail & hiself has recently moved from the Sacramento, CA area, to our dream of living on the Mendocino Coast. It's products like Glass Dharma I am glad I started getting into product reviews, I'm amazed at all the wonderful products that I have had the wonderful opportunity to try products like Glass Dharma products. 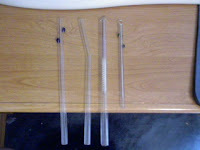 I have a fascination with kitchen type items such as Glass Dharma drinking straws. Anything that is funky and is a good conversation piece such as Glass dharma straws I love to have. These funky glass blown straws are for sure to be a convo. starter. 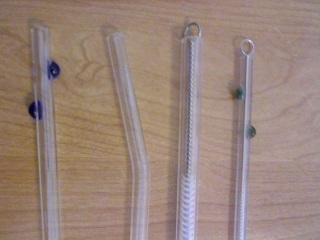 David and their wonderful employees sent me 4 different straws to try out. The blue spotted one on the far left has glass blown blue balls/spots on the straw Its funky and yet versatile for every day drinking to special occasions. The size is 9.5x9. The curved drinking glass second to the left is curved, Great for higher spoutdrinking glasses, Or just for that more edgy drinking straw, the size is 9.5 a a more of a slurpy drinking straw. 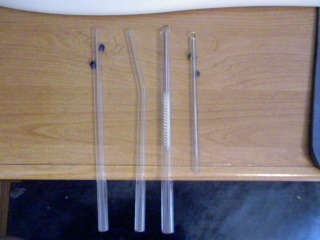 The straw second to the right is more of a hefty drinking straw sizing at 12x9! Its straight body would be perfect for those thick summer time malts. It's super thick body would less likely to break unless you seriously beat it against a table, Even then I'm sure this big boy will put up a fight. The straw on the far right has green glass blow balls on the side to give it a little bit more sass then your regular straws. Perfect for sipping margaritas or a bit more chill with a fresh cold glass of lemonaid. Each straw is glass blow and made in the USA. 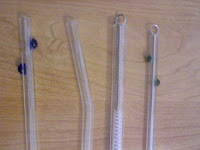 My straws came with 2 pipe cleaners 1 for the skinnier straws, and 1 for the more hefty straws. If you are looking for something to sassy up your boring drinks or to decorate your cups with style withought breaking your bank. Glass Dharma starts at $6.50 - $12.00! Considering how much landfill you will be saving you will want some for yourself, friends and family! ♥ If that doesn't make you want them then keep this in thought - Glass Dharma is - Sustainable, Beautiful, Dishwasher & Microwave safe, Kid Friendly, Lifetime Guarantee. ♥ I receive no monetary compensation for this review. I was provided Glass Dharma straws to try and give my honest opinion.